Photos of the aircraft are credited to the respective photographers. 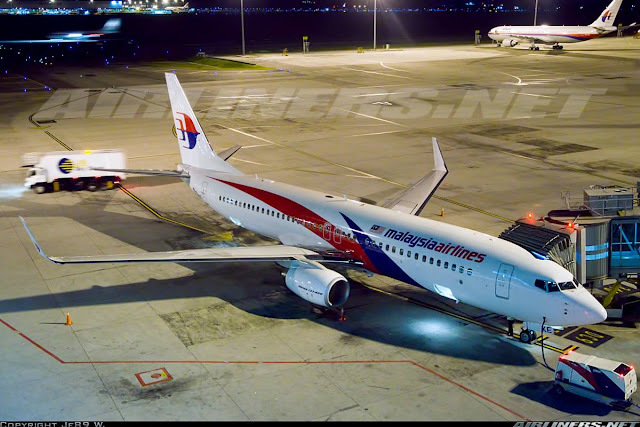 This is my return leg of Malaysia Airlines' Boeing 737-800 joyride and because I couldn't go for the Langkawi trip due to work, I had to split my trip into 2 parts. The night before, I flew on Air Asia up to KUL, my 2nd time on 9M-AHF and was quite disappointed with that. I decided not to do a trip report on that flight since its was a normal flight with mediocre cabin crew on it. 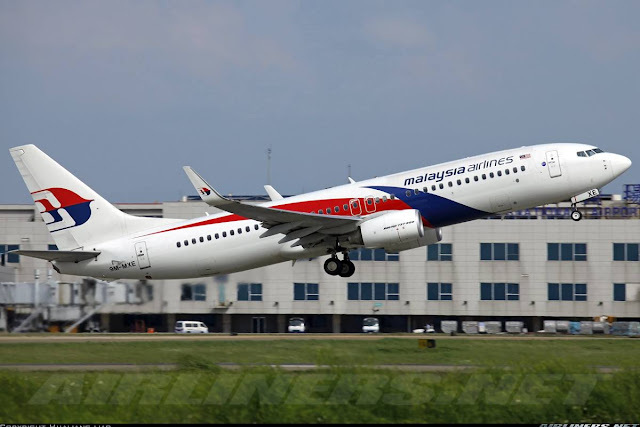 Malaysia Airlines is undergoing some changes to it, so I had to fly on it before the changes takes place, furthermore I wanted to fly on the newer Boeing 737-800s, both the MS* and MX* serious would be great. Flying on the airline's Singapore to Kuala Lumpur and vice versa depends on your luck, sometimes you get the old cabin 737-800, sometimes you get the new cabin. I was hoping to get one of the newer ones and not the FF* series which I have already flown. The airline allows up to 48 hours for web check-in and this is quite useful to reserve your seat and save your time of queueing up at the check-in counters. This time I decided on the bulkhead seat. The passenger at row 5D ended up moving to the rear, great for me as I got myself the whole row for myself. Got my mobile boarding pass which I didn't use it at all, got the proper boarding pass at the check-in counter instead. Since the flight was taking place at its home base, I couldn't check my flight on Flightradar24 on which registration would I get, I would find out at the boarding gate and that reminds me of the good old days of flying. I arrived at KUL the previous night and stayed at the Capsule at KLIA2. I paid around RM100 for the 12 hours which is worth it. Definitely not for those who prefer privacy and comfort. Not saying its not comfortable, but it can be a bit noisy depending on who your neighbour is. Anyway, I got up at 7 in the morning, checked out and made my way to KLIA. It took around 10 minutes to get there plus the waiting time at the train station. Once there, I went to check in at the Malaysia Airlines' check-in counters. As I had nothing to check-in, I joined the no baggage check-in counter and it took me around 10 minutes before I got my boarding pass. The reliable express train system at KLIA. The queue was long, fortunately I did my online check-in and could avoid the queue. Here I am, fortunately I was able to go first since I had no baggage with me. The question is at the next counter, B17, why are there passengers queueing up at that line since its clearly stated its for passengers without baggage. Folks have to learn how to read! Got my boarding pass and row 5F is where I was sitting. Checking the other flights while I was on my way. Since my flight was at gate H, I didn't have to leave the main building, I walked around the shops and did a bit of plane spotting since I had some spare time. I went to gate H2 where I was supposed to depart from. There were 2 aircraft at the gate, one was MXC and the other was MXE. I was happy that I would be getting the MX* series and even happier when I saw MXC which has the oneworld livery. 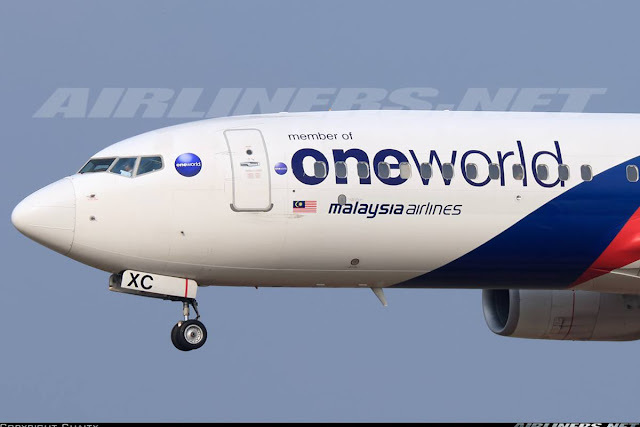 Here is the photo of 9M-MXC with the 'oneworld' titles. It turned out to be flying on another flight and 9M-MXE was taking me to Singapore. I can't complain after the previous night I got myself 9M-AHF (Air Asia) which I have already flown before. It turned out to be less than 50% load. Good for passengers like myself, but bad for the airline. With Malindo Air, Air Asia, Jetstar and Tigerair competing fiercely on this route, its no wonder this airline is not making money. Announcement was made and boarding was a quick affair due to the light load but we were made to wait for a while at the gate, waiting for our clearance from the air traffic control. The Captain kept us well informed about it and also our flight path and weather ahead. 9M-MXE - one of the many Boeing 737-800 in the airline's fleet. I was greeted by two beautiful cabin crew who greeted us at the door, that's a good start to our flight. I had a short walk to my seat. Minutes later, a lady was supposed to be sitting at Seat 5D, but after seeing me at the window seat, she asked the crew whether she could move to the rear to sit together with her friends. Fortunately for me, she moved and I had the whole row to myself! Making my way in. Business Class was at least half full. My Bulkhead seat at row 5F, very good legroom space. I prefer to have the IFE Screen in front of you instead of having to take it out from the hand rest area. Its nice to have both seats vacant, its as good as having a business class seat or may be even better. The maroon colour does look good. I would say row 5 is probably the best row in Economy class. The seat at the emergency row is spacious too, an alternative to row 5. Some cabin photos of the Economy Class. I am a big fan of the Boeing Sky Interior. The cabin crew had a light load to work with, so their job for this leg was quite a relaxing one. Just like the previous leg, a choice of drink and a packet of peanuts were served. The cabin crew were good, they were polite and friendly. The flight to Singapore was a smooth affair, in fact I found the ride to be too short for my liking. Barely got myself warmed to the seat, it was descending to Singapore. We touched down smoothly on runway 20R and taxied along South Cross towards our assigned gate at Terminal 2. Here are some window shots of my flight, from take-off to landing. I love the view of the engine and wing. Parking beside the company's Boeing 737-800. Pushed back and I spotted Malaysia Airline's Airbus A380 - I never understand why the airline has a different livery for that aircraft. Soon, we were on our way after clearance and engines were started. We raced against the airline's Airbus A330-300. The strange thing is the Airbus A330-300 reached the threshold first but we departed ahead of it. Entering the runway, we were given the clearance for take off. The climb was smooth and this view is very familiar to me after doing this route so many times this year. It was an enjoyable take off - powerful and smooth. We were at cruising flight level not too long after. The sky was clear and soon we started our descend. Captain announced to the cabin crew to prepare for arrival and not long later, seat belt sign came on. After a few turns, we were soon lined up for runway 20R. Passing by Changi beach, a spotting area for aviation enthusiasts. It's nice to be on the aircraft being photographed by plane spotters. Seconds more to go before we touched down. We had a smooth touch down and the pilots used the autobrake system to slow the aircraft. Here we are, we parked at the gate at the central apron. This airline has decent in-flight products on its newer batch of Boeing 737-800s but I won't want to fly on it for flights more than 3 hours. This airline is now trying to scale down its operation to reduce its losses by maintaining the profitable routes, cutting away the loss-making routes, reducing capacity on many routes and attemptting to get rid of the larger capacity aircraft, Airbus A380. For the Boeing 737-800, lots of regional routes are operated by this aircraft and its hard to avoid it. The reason why I won't want to fly on this aircraft type for flights more than 4 hours is because of the cramp seat in the Economy section especially when the flight is full. In-flight service of both flights are not bad, but I still prefer the service in the past (1990s). Those days, Malaysia Airlines was ranked one of the top airlines in the world and I enjoyed flying with them back then. Time has changed now, its sad to see this airline struggling especially with the 2 accidents happened not too long ago. Hopefully with the new CEO in charge, he can turn this airline over, back to being competitive once again. Thank you for your detailed description, this helps.